What is a Pandeiro? 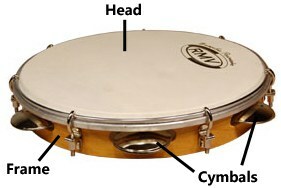 The short answer is “it is a Brazilian Tambourine”. Rather than talk about it here is a video that demonstrates the instrument in action. This is the Trio Brasileiro a Brazilian trio dedicated to the most Brazilian of all music forms, the Choro. On the left playing the Pandeiro is Alexandre Lora, on 7 -string guitar is his brother Douglas Lora and the musician on Bandolin (5 course mandolin) is Dudu Maia. As you can see and hear the Pandeiro drives the music and as with all Brazilian music the Pandeiro is the heart beat of the music. One could go as far as to describe it at Brazil’s national instrument. This a relatively simple tiny instrument that looks much the same as a standard tambourine but it is a little slimmer and is held and played in a different way. Why my Interest? A local clarinet player is considering getting into playing Choro and there is a suggestion out there that there could be a demand for a Pandeiro player. Although I have a couple of Pandeiros in the basement I have never really got to grips with acquiring the technique. Now might be a good time to remedy that deficiency. So after a quick search of YouTube, where there are literally hundreds of videos, the following 8 videos seem to be the most useful. Scott Kettners approach is logical, graduated and relatively uncomplicated. So the process begins. So, I suppose the obvious question is why clutter up a perfectly “good” blog with all of this. Well for me it is just a way to collect all the information in one place to aid the learning process. Possibly there are some other percussionists in the area who may also be interested in expanding their repertoires. If so, here it is all in one spot. This entry was posted in MUSIC and tagged Brazilian music, Commentary, Tutorial by Rod Wilson. Bookmark the permalink.